← Kings Cross four unidirectional lanes for cars, but sorry we are not able to afford space for a cycle lane, it would slow the cars down! 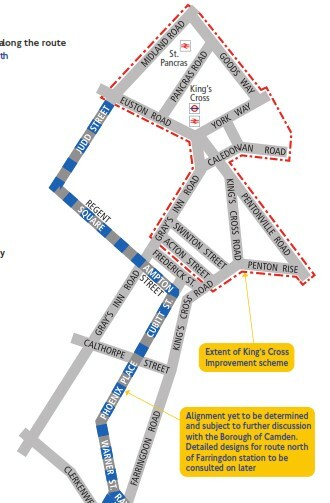 Now either I missed it the first time or it has quietly appeared but I have just found a graphic on the TFL consultation on the North South cycle superhighway which show that TfL’s intended endpoint for cycles is in fact to dump them into the Euston Road and Kings Cross gyratory at Judd Street. When we first wrote about the route a week ago I didn’t see this diagram and speculated that the endpoint might be Argyle Street. The full diagram is here. We are promised a further consultation. I am now getting confused by all the local plans – I think this means that cycle traffic coming from the South, heading north will have to turn right then head up the madness of Pancras Road with it’s crazily u-turning cars and taxis or York Way. Or go left, then make a sharp right up Ossulton Street with it’s huge traffic calming bumps for a long way around Kings Cross/St Pancras. Or is there a plan somewhere for a contra-flowing cycle lane up Midland Road. Grateful if someone could update in the comments. Cllr Paul Convery has said in comments that Islington and Camden are still working on plans to dismantle the entire gyratory. Which as gyratory resident Tony notes might allow a North South cycle lane across Kings Cross Bridge (by the Scala). Daniel a local cyclist has written about the absurdity gyratory recently so I thought it worth publishing this. Bigger diagram below. This entry was posted in Bad Gyrations KX Campaign, Transport and tagged Cycling, Gyratory. Bookmark the permalink. 8 Responses to Does this picture confirm that TfL plans to dump North South cycle superhighway traffic into Euston Road and Kings Cross gyratory at Judd Street? I am leading Camden Cyclists’ deliberations on the routing (in Camden) of the N-S Cycle Superhighway (CSH). We hope to arrive at a joint position with ICAG (Islington Cyclists) on what would be best for cyclists. Discussions are in progress with ICAG people and with Camden Council. TfL state that a segregated cycle track on Farringdon Road north of Ray Street is not possible because that part is narrower. They have ruled out Gray’s Inn Road too. The timing for the CSH (implementation in 2015) is so different from that envisaged for the gyratory that an interim solution seems to be called for. One approach would be a dual routing, one to the West as shown on TfL’s plans or similar and the other proceeding up Farringdon Road – Kings Cross Road as far as possible, then somehow crossing Pentonville Road to reach Wharfedale Road and York Way. It is vital for cyclists using the CSH to be able to reach the railway lands. Here is a blog I have started on that subject: http://velo8to80.org/?p=7 . We hope to meet with ICAG in October to discuss this. Would you like to participate? I don’t think this is a case of North-South “dump” cyclists at Judd Street. Presently, Midland Road is southbound only. But a segregated, contra-flow cycle path is perfectly possible, just needs reducing the southbound vehicle lanes. There are other north-south possibles, particularly Argyle Street – Pancras Road and I’m enthusiastic to get a variation of this to take cyclists onto the Kings Boulevard and then to Goods Way – which is a natural desire-line for cyclists on the Bloomsbury to Islington/Hackney routes. Sorry to add, George Coulouri is quite right. The timing is important to recognise that the north-south cycle highway timescale is 12-18 months but the gyratory removal is 5+ years. It’s important to have solutions that work in the interim but also not to implement things which make it harder to secure the gyratory removal. 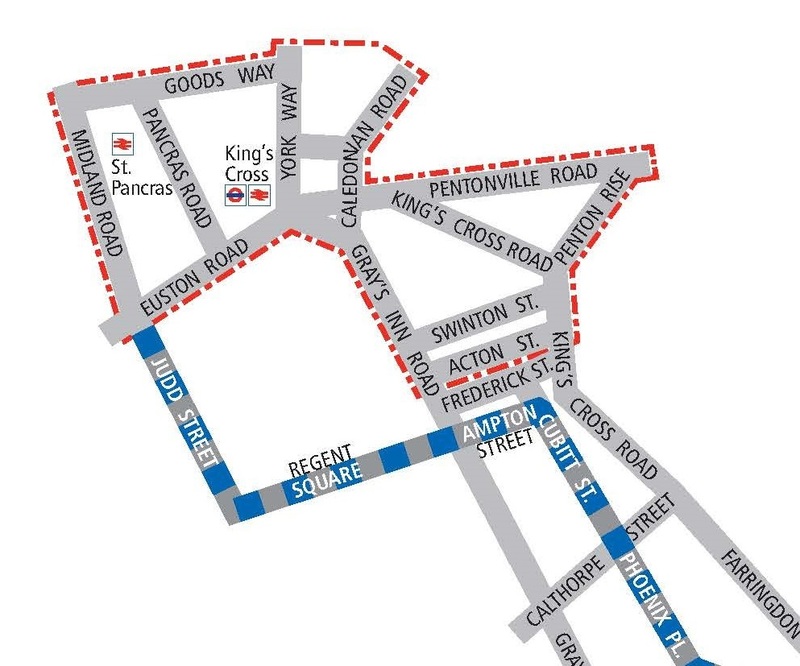 There would be ample space on Kings Cross Road and Acton Street and on Grays Inn Road for straight through passages. Of course there is but what matters is not what you and I think, but what TfL says and does. Join us in campaigning to make them change. It will take massive political pressure. So we now have 3 phases of changes? Firstly the current interim interim solution at Grays Inn Road – York Way – etc, imminently, which we all know is a nonsense and worse than useless. Secondly, the “super highway” route which – even if not the ultimate solution – is absurd if it doesn’t take cyclists to the Kings Cross interchange itself, and hence – in my view – is not worth doing. And then, in 5 (??) years’ time, getting rid of some of the two-way roads and making allowances for cyclists in the new layout. But if the complete lack of cycling provision (in fact the worsening of the situation for cyclists in some ways) in the current Cally Road 2-way plans are anything to go by, then that will do nothing for cyclists either. What’s needed is the money being wasted (or planned to be wasted) on the first 2 phases I mention being combined and used to put in – asap – segregated cycling space straight through the middle of the KX junction itself, in a way which any longer-term changes to the gyratory could mostly leave in place. Frankly, everything I’ve seen put forward by TfL so far is (as far as KX is concerned) pathetic. Cycling is not something too untidy and peripheral to be catered for at KX – it shouldn’t be something that has to be pushed aside and found space for a few blocks up the road, “out of the way of the real traffic”. KX is not a motorway intersection, it’s a place which human beings go to and from and through and via, and pedestrians and cyclists have as much right to access it safely as do motorists. And if there really isn’t space for everyone (which there would be if fewer of them sat in their wasteful and dangerous machines), then it’s not the _people_ who should give way. The unnecessary machines should have to fit round us, not the other way round. If car-drivers don’t like the result of pedestrians and cyclists being facilitated and encouraged at KX, then the answer is obvious – their cars (literally) don’t have to be here.